The Grand Canyon cannot be photographed. Its scale defies any representation, and being there is always a shock, however many times one has visited. The canyon is 18 miiles long and a mile deep. A MILE. 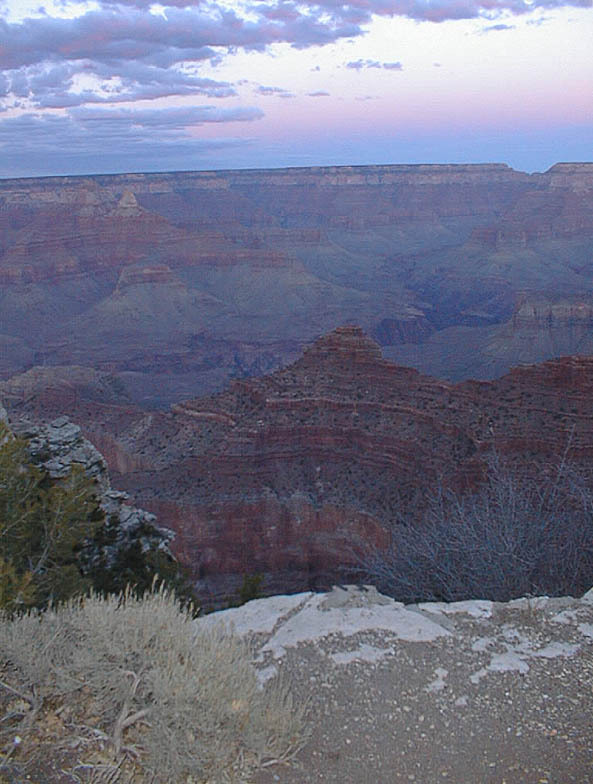 The elevation at the south rim is over 7,000 feet in altitude, and the river runs at 2,000 feet above sea level. Our visit was made somewhat painful by the human proclivity to test the fates. An alarming number of people ignore the warnings about staying on the paths, and feel compelled to walk over to the edge to have their picture taken. Why? But then I don't understand mountain climbers, either. We were fortunate to be there two days before the first big snows came, and there were relatively few kamikaze tourists, so we could walk long sections of the rim trail without doing serious damage to our sphincters. Somebody said that fear is just the inability to supress the imagination. The Grand Canyon is the world's best confirmation of this theory. It is also proof that human representations by graphic means will never supplant direct experience where scale is at issue. I think I remember that Kant defined the sublime (as opposed to the beautiful) in virtue of its component of terror. This canyon is sublime.